« Deadline Dishes — Chocolate Cake with Nancy C. Weeks! Today I’ve got the fantastic Laura Chapman with me to share one of her awesome deadline recipes. But before we get to the recipe, let’s find out a little bit more about Laura! 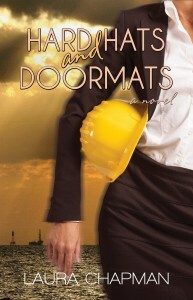 Chapman found a way to mix her love of romance and humor as a women’s fiction blogger and author. 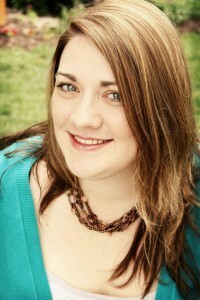 A 2008 graduate of the University of Nebraska-Lincoln, Laura studied journalism, English and history. She spent four years traveling the country as a writer/photographer, and currently works in communications. Born and raised in Nebraska – in a city, not on a farm – she is a devoted fan of football, British period drama, writing in bars and her cats, Jane and Bingley. Hard Hats and Doormats is her debut novel. And now it’s time for the deliciousness! Yum. I can’t wait to try this recipe. March is the month of St. Patrick’s Day, which means I’m often looking for ways to slip a little green into my meals. As a pescetarian – vegetarian who eats fish occasionally – it’s important for me to work some protein into those same dishes. And as a writer, it’s absolutely crucial dinner is something I can throw together quickly and re-heats up well. 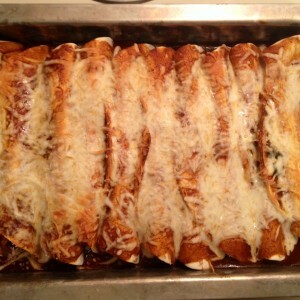 That’s where my Green Enchilada comes in to play. 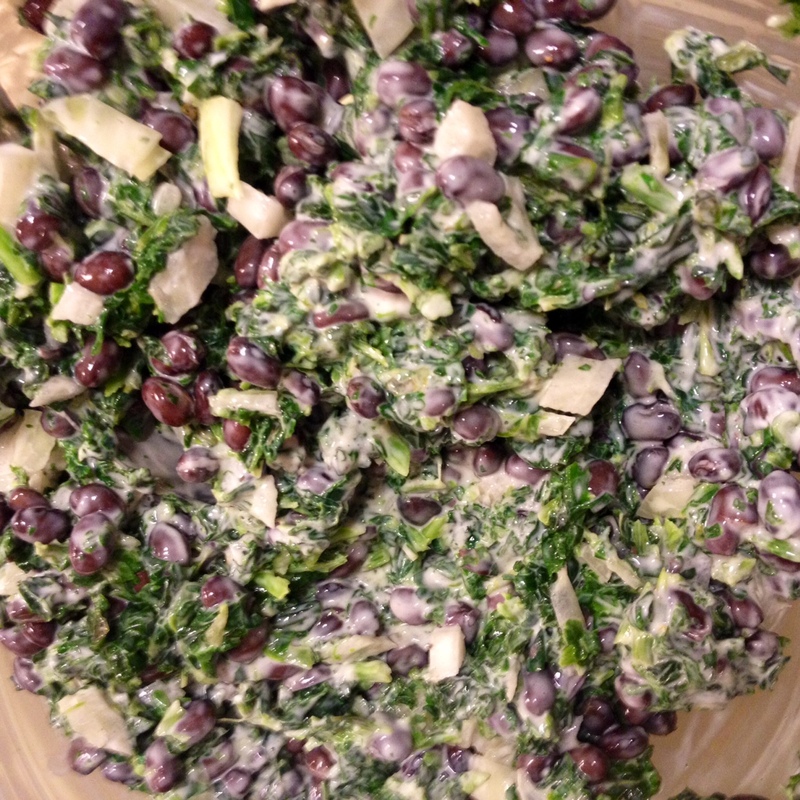 Made out of kale, spinach and black beans, this dish has plenty of protein, fiber and other nutrients that give me the energy I need to balance a writing career with a full-time job. It’s also delicious. Pre-heat your oven to 375 degrees. In a large bowl, defrost your frozen veggies. While that’s going on, chop up your onion and set it aside. 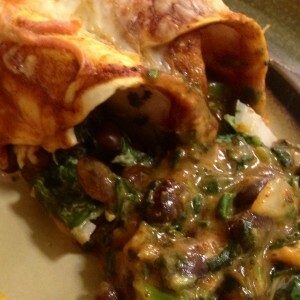 Once the vegetables are heated, mix in the black beans, onions and sour cream. I prefer to use a light or low fat sour cream when cooking to cut out a few calories. You could also try subbing a Greek yogurt, but make sure it is plain. 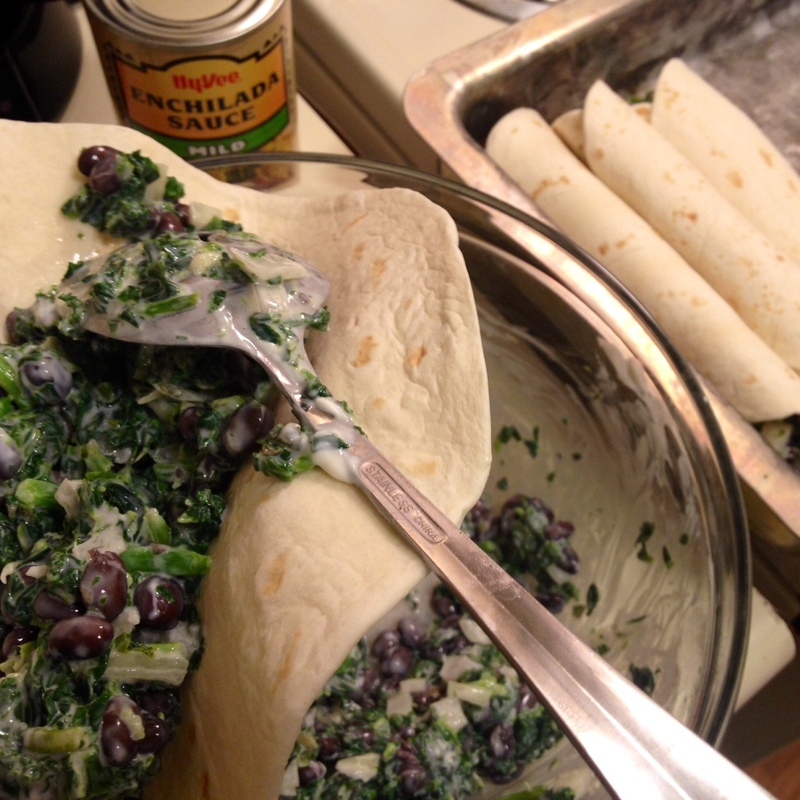 Toss the tortillas into the microwave for a few seconds to soften them. Corn tortillas are brittle, especially if you store them in your fridge, and this will make them easier to work with. Scoop large spoonfuls of the filling into the corn tortillas leaving enough room to fold the tortillas like a blanket around a baby. Line the filed tortillas in a 9 x 17-inch baking dish. 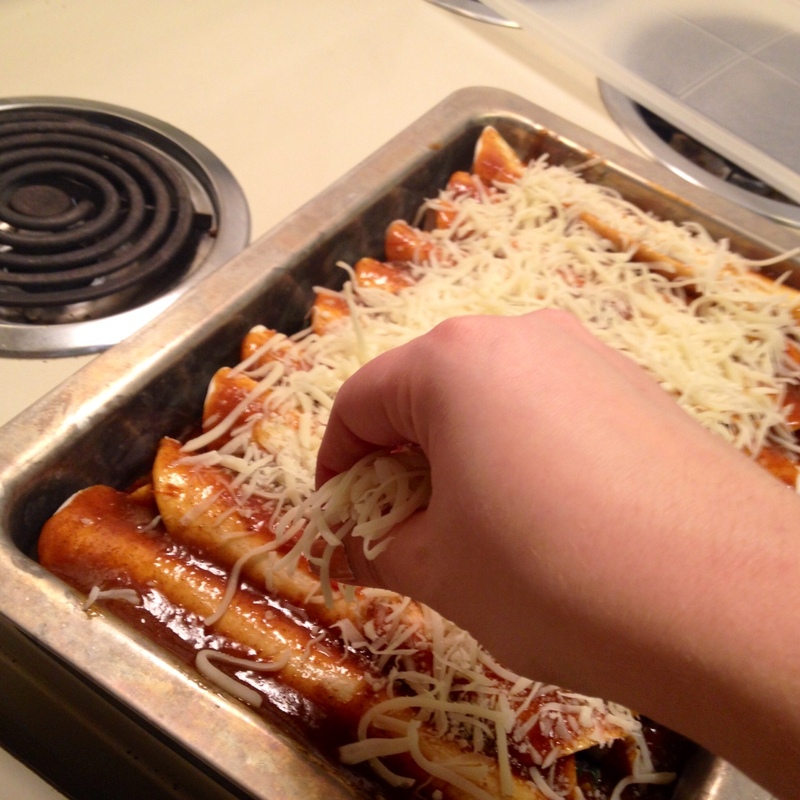 Pour the enchilada sauce over the top. 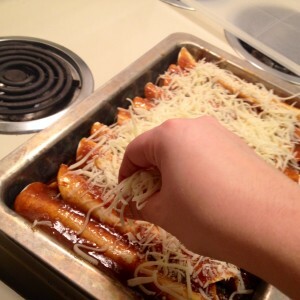 Sprinkle the cheese over the top. I use a skim mozzarella for the same reason I use the light sour cream. Place the pan in the center of your oven and bake for half an hour. This is the perfect amount of time for me to sit down and tackle some marketing or write a couple of pages before the timer goes off. Depending on how your cheese looks, you may want to turn it to broil for the last minute or two of baking to give the cheese an extra bit of melt. You can do whatever you like for serving sizes. I prefer to cut it into 10 pieces, casserole style, because this is a hearty enough meal to leave me full. I typically serve this with a side of chips and salsa – I love chips and salsa – but it goes equally well with Mexican rice, beans or a salad. The dish looks good and I’m definitely going to try that for a Friday Lent dish. read the blurb and I’m going to be checking it out. Thanks. dinner and a book!